All excited, he ran to the garden, the precious pebble tight in his arms. There was a full moon. Out of breath, Alexander stopped near the blackberry bush. "Lizard, lizard, in the bush," he called quickly. The leaves rustled and there stood the lizard. 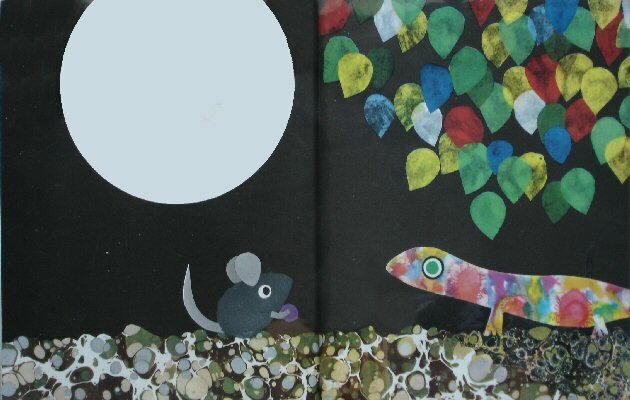 "The moon is round, the pebble found," said the lizard. "Who or what do you wish to be?" "I want to be..." Alexander stopped. Then suddenly he said, "Lizard, lizard, could you change Willy into a mouse like me?" The lizard blinked. There was a blinding light. And then all was quiet. The purple pebble was gone.